March 31 - April 1, 2012: Lummus Park, SouthBeach hosted the 2012 LUDUS Athletics ModelBeachVolleyball Tournament. This was my first time going but this event is done every year, (I believe in different cities but I could be wrong) featuring the top modeling agencies in Miami to benefit a national or international charity. This year it was "models4water", www.models4water.org, Drink. Live.Thrive. The organization was founded by Heide Lindgren and Georgie Badiel for the purpose of providing clean water to developing countries, starting with Burkina Faso, Georgie's homeland. Through partnerships with fellow fashion models, the organization aims to increase international awareness and raise funds surrounding the most basic human need and right: Clean Water. This is a cause Franovik Designs and Models&Designers Magazine would like to be part of. We had the honor to be part of this very important tournament. We have worked with models that played in the tournament. We kept to the sidelines cheering for all the agencies; the top two that went to the finals were Elite Model Management and Runways Talent Group. The weather was amazing, typical South Florida weather, sunny and a soft beach breeze. The aroma of sun tan lotion all over the place, you had to be there. Sponsors of the event were there to cheer and show their products, from flavored vitamin water to vehicles. The VIP area well stocked with drinks, food and comfortable sitting areas. We had a blast!! Obviously, the highlight of the day were all the beautiful models, both male and female, fighting for the esteemed trophy. After all was said and done, Runways Talent Group won!!! Congratulations. We want to thank the event producers for inviting us; we can't wait til next year....who knows the tournament could be a Fashion Designers volleyball tournament (Hint, Hint). 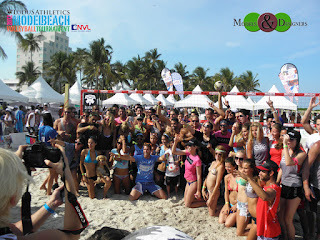 Check out their websites www.modelbeachvolleyball.com and www.models4water.org and make a donation for this great cause. Stay tuned to my websites for other pictures I took ath the event.